There are two paths to access the back end of the TerminalFour system in order to make changes to your department or college website. 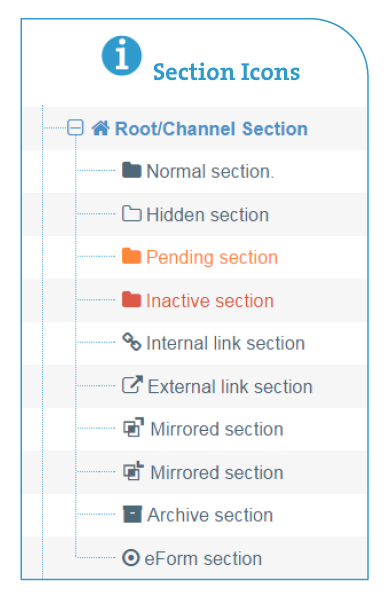 Below is information on Site Structure access, which involves logging into the back end of the system at https://cms.drake.edu/terminalfour/login and viewing the overall structure of the website in an outline format. You will only see the sections that you have access to make changes to. Each folder is a new section (page). The + symbol next to the folder will expand to show any subsections nested underneath. The color and outline vs. solid color indicate the status of the section. To make changes to a section (page), go to the corresponding Actions menu. The pull down menu displays the options to edit the page/content. If you decide you want to edit in Direct Edit mode instead, there's a shortcut. Yellow highlight indicates the section (page) you are interacting with. Green: The (section) page has been approved and published. Yellow: The (section) page is waiting for approval or pending.